← Elections 2015: was the BBC’s coverage impartial? 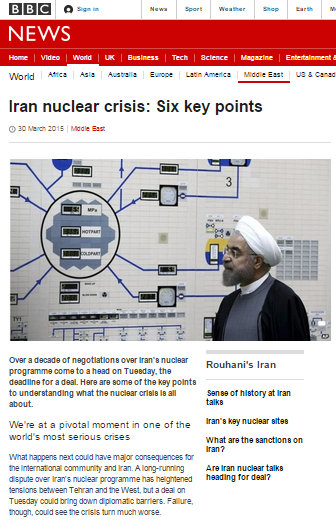 As the P5+1 negotiations with Iran in Lausanne approached their deadline, coverage on the BBC News website’s Middle East page included what appeared to be a handy guide intended to assist audiences in better understanding the technical background to the story. That impression continued in the opening paragraph of the March 30th article titled “Iran nuclear crisis: Six key points“. However, what audiences actually got was a dumbed-down space-filler which did little to enhance their understanding of the real issues lying behind the difficulties in securing the framework to an agreement which would prevent Iran from gaining nuclear weapons. We’re at a pivotal moment in one of the world’s most serious crises. No further details are given on the technical aspects of the definition of break-out time or how the pending agreement would guarantee that one year minimum time-frame. The article continues the long-standing BBC practice of ‘impartiality box ticking’ presentation of Iranian claims, despite the fact that the IAEA has clearly stated that it is not in a position “to conclude that all nuclear material in Iran is in peaceful activities”. “Iran for its part says it does not want a nuclear bomb, but insists on exercising its right to run a peaceful nuclear industry. It also wants crippling international sanctions lifted quickly. “What also worries the international community are unanswered questions surrounding possible military dimensions to Iran’s nuclear programme. The BBC article does not visit the topic of if or how that issue will be addressed in the emerging framework deal. No mention is made of the contentious issue of Iran’s existing stockpile of uranium, of the all-important topic of verification of Iranian compliance with the terms of any deal or of the wider – but related – picture of Iranian activities across the Middle East. Hence, when readers get to the section titled “Some countries are unhappy about a pending deal” they are still not in a position to understand the background to the vague statements it includes. The BBC has some talented science correspondents who are surely capable of compiling the long-needed fact-based backgrounder which has been glaringly absent from the corporation’s coverage of the P5+1 negotiations with Iran to date. In the meantime, readers will no doubt find this fact sheet on the subject of nuclear break-out time written by the former deputy director-general for safeguards at the IAEA helpful to their understanding of this story. 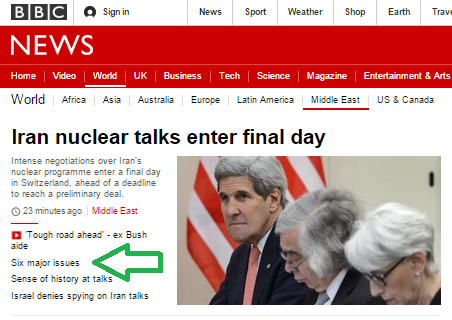 Does BBC coverage of the P5+1 deal with Iran adequately promote audience understanding of the issue?